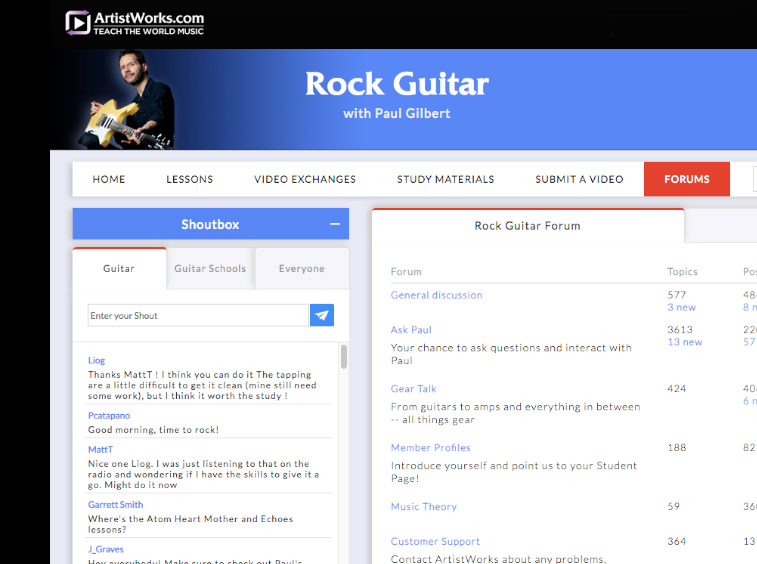 Discover thousands of online music lessons across multiple genres. Players all over the world are experiencing the difference at ArtistWorks. The Grammy-nominated rock guitarist breaks down his indestructible playing techniques in an approachable way. Grammy® and multi-IBMA Guitar Player of the Year teaches bluegrass guitar lessons for everyone. The Grammy® artist teaches bluegrass mandolin lessons & many other genres reflecting his celebrated music career. The Grammy® winner takes you step-by-step through 5-string banjo fundamentals to advanced techniques. Each instrument has a massive lesson library that covers the fundamentals, advanced techniques, and key learning strategies. From drums to guitar, our virtuoso teachers offer high-caliber instruction to the entire world. Lessons are accessible anywhere, from any device. 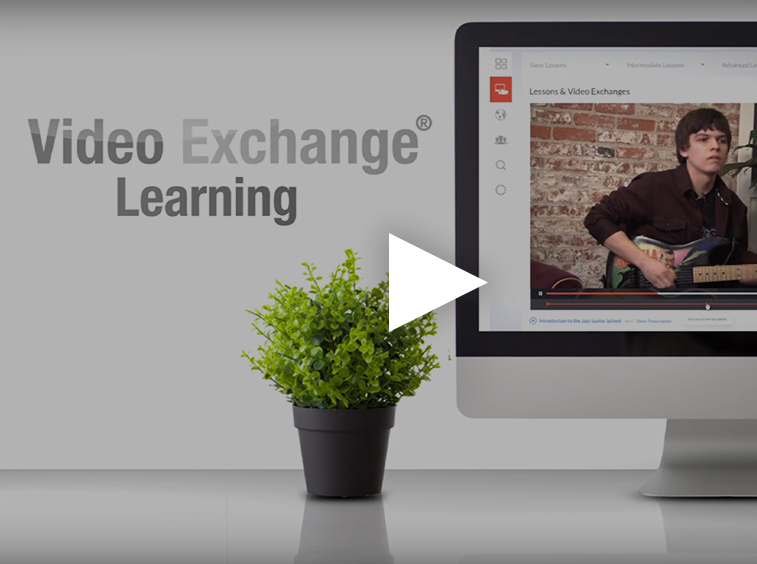 We're committed to making you the best musician possible, and Video Exchange Learning® allows our teachers to guide your progress. 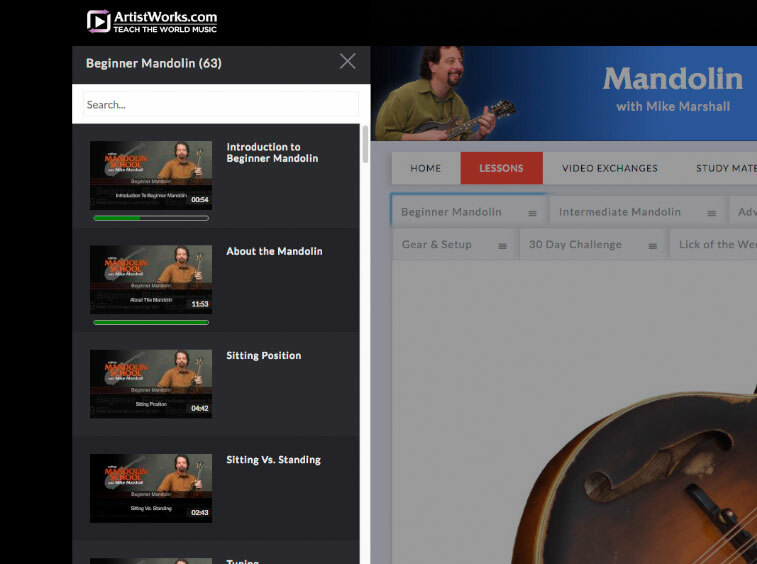 Available only on ArtistWorks, you'll record practice videos, learn from other students' breakthroughs, and receive tailored video feedback from your instructor. Our students gain access to a real community, where they can share their original songs, chat with new friends, and encourage each other to grow as musicians. We have the best online music lessons for adults, teens, and the young at heart. Enjoying website immensely. Excellent lesson sessions with terrific amount of written music and sound accompaniments. Very good value for price. Would highly recommend to anyone interested in learning an instrument! Best Music Tuition on the web . I think Artistworks is really great! I would recommended everyone, who would like to play or play better! I have been playing the guitar since 25 years, and I can tell, by using Artistworks I became a much better player only in a few months. Paul Gilbert is really an excellent teacher, not only a world famous super-virtuoso "guitar god", but also a very humble person, who is really trying to use all his expertise and experience of decades of high class rock guitar playing for the sake of explaining things as easy as possible. No secrets, no hidden tricks, Paul is giving all his knowledge to the students. With Artistworks, it is really up to You only! All you have to do is practicing, the knowledge you will get here! Paul is also making this with so much humor, the lessons are always fun with him, I laughed a lot. My wife also started playing the piano Artistworks, and she enjoys it a lot and also she develops really quickly! The Paul Gilbert lessons are amazing and have totally transformed my playing. Aside from teaching me new things, he helped me unlearn many bad habits that limited my playing. I have been a member since 2012 and have run through the entire course three times. Paul is continually adding personally-tailored lessons that keep me coming back for more. Last year he taught me to play all of Van Halen I. I will be a member for life. Worldwide access to worldclass musicians! Studying music from wherever you are! How great it is that one can study jazz drums with the amazing Peter Erskine! And all those other great musicians. As i like to travel more often it is very handy to be able to study music from everywhere. The possibility to send in your practice videos to get personal advice from these teachers is wonderful. But even without sending in videos you can learn so much from other students and from the curriculum. Next to that, one can meet fellow student-musicians from all over the world. Of every age, personality, musical style. Everyone - beginner to professional - can find a musical welcoming home here. The best online music lessons that I have seen. Great concept! Paul ist the best teacher in the world! Very good detailed videos, together with music scores in PDF format. Easy to follow and of course you can play the videos over and over to your hearts content, until you have mastered each technique. Good detailed instructions. The best teachers! thank you for offering lessons on line. Darol's content is fantastic. I've been doing his Fiddle Academy on and off for years. I always come back when I'm feeling plateaued out and frustrated and he pushes me to a new level. Tony Trischka changed my life! Opened me up to the possibilities of the banjo and allowed me to continue to move forward on my own (isn't that the definition of a good teacher?). I'm doing stuff on the banjo I never imagined, in large part because of my work with Tony. He's so knowledgeable and supportive, and a great human being. Just released my 2nd CD since leaving ArtistWorks, and going strong. Excellent material - always available. Bryan Sutton amazes me with the time he devotes to each student - and other students VE's. I have not submitted my own VE's but I plan to in the future. Very good instruction with easy steps to follow and fast feedback at least with my instructor guhtrie trapp.if you cant learn something from this course,beginner or pro,you might consider doing something else. probably one of the best sites on the Web, hands down! You get what they advertise,you get out of it what you put into it. I have been a user of Artistworks for around eight years now. I study Fingerstyle Jazz guitar with Martin Taylor. The site is fantastic and really easy to use. There are lessons and videos Exchanges which are like mini lessons themselves. The site is also a great place to interact with other musicians across the world. A social media platform within your chosen guitar Site, as well as the Artistworks main site. The great thing about the Artistworks video Exchange system is you get personal one to one feedback from your chosen Tutor. My guitar playing has improved so much since I started Exchanging videos with Martin. I was already an experienced Guitarist before I started. But there is always new things to learn . I would highly recommend to anyone who plays guitar and wants to try something new. Great material, videos and having the video exchanges is awesome! Tony puts so much into each video exchange. Awesome platform, with a great opportunity to learn from some of the best teachers. Choose an instrument and music style preference and we’ll send you free music lesson samples, exclusive offers, news about our courses, teachers and much more!